It's always lovely to get repeat business, though possibly not something you should expect when making Wedding Cakes! Erin and Sean married several years ago and came back to us for baby Genevieve Rose's Naming Day Cake. The wild rose flowers were an obvious choice and as Erin and Sean are both Biologists they asked us to include a selection of 'cute' bugs. "We loved the cake! It was beautiful (a real show stopper) and tasted heavenly (no one believed it was gluten free.) Genevieve was fascinated by the cake and had to be held back!! 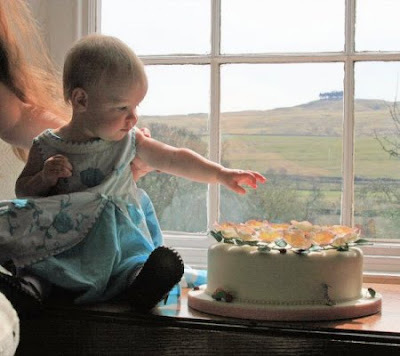 We had a wonderful day, Genevieve was on good form and the whole day was made even more special to have one of your cakes in another family celebration..."